Many perspectives that we have in life are helpful and support us in our life choices, but occasionally we feel stuck or unhappy with the situations in our life and we can’t seem to move forward. At times like these a dis-empowering perspective, which does not allow us to see the full range of possibilities or options, may be standing in our way. We have come up with a list of key group areas of dis-empowering perspectives. 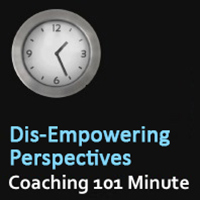 If you want to read along, I really encourage you to sign up for a Coaching 101 class next week and download the Reframing Perspectives module. Filtering – Focusing on the negative detail of the situation and filtering out all the positive, only seeing the negatives. 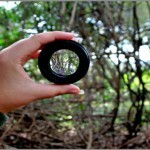 Polarized Thinking – Seeing a situation as either good or bad, right or wrong, perfect or a complete failure. Over Generalization – Making a general conclusion based on a single incident or a piece of evidence. Mind Reading – Making assumptions about what people are feeling, why they’re doing, the things they’re doing, without actually having any evidence that this is the case. Personalization – Thinking that everything people do or say is a reaction to you. Control Fallacy – Thinking that you are responsible for everyone or everything around you. Fallacy of Fairness – Being resentful because you believe that everything in life should be fair. Emotional Reasoning – Believing that what you feel is the truth when it may not actually be the truth. When you feel as though you can’t make a breakthrough or achieve a goal or solve a problem, it is worth spending some time exploring your perspective on the issue. Sometimes you will find that your perspective can be an issue of a dis-empowering perspective and is an opportunity for you to refrain and to see things a bit differently. 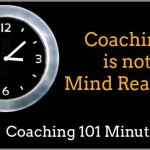 Other questions that were asked in our Coaching 101 classes this week focused on building your coaching practice. What are the best business practices as a coach? 1) Do I need in a website? 2)Do I need to have clients that are local? 3)How much should I charge my coaching clients per hour or per month or per package? If you want to learn more about these questions, about Refringing Perspectives, or about building a business as a coach, we encourage you to come to an upcoming Coaching 101 class and register. We have openings for next week still available, so come along and save your seat.